Monday May 15th 1893 We got up early for Mr Gordon to take the train. Josie got an early start at the washing. We got that done and the things taken out of the little room up stairs. In the afternoon I pout things in and a new matting down and helped Josie iron. We slept up in our new room. Tuesday May 16th 1893 We went right to work at Fannys rooms as soon as breakfast was over. I did some baking too. They were all cleaned up by four oclock. I did a little more picking up about the yard. it was a nice day with a cool wind. 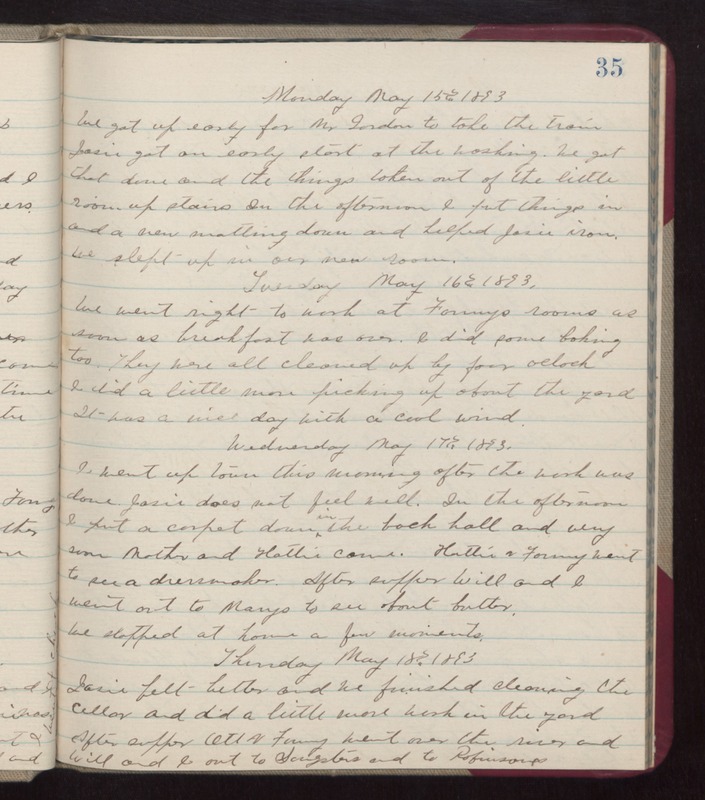 Wednesday May 17th 1893 I went up town this morning after the work was done. Josie does not feel well. In the afternoon I put a carpet down in the back hall and very soon Mother and Hattie came. Hattie & Fanny went to see a dressmaker. After supper Will and I went out to Marys to see about butter. We stopped at home a few moments. Thursday May 18th 1893 Josie felt better and we finished cleaning the cellar and did a little more work in the yard. After supper Ott & Fanny went over the river and Will and I out to Songsters and to Robinsons.